International Migratory Bird Day effort with our Audubon Adventures students. 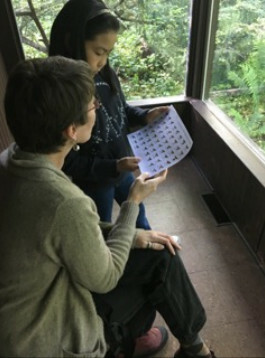 Here she helps a Cheltenham Elementary School Audubon Bird Club student with the identification of a warbler that visited the water feature at the Griscom Bird Observatory. 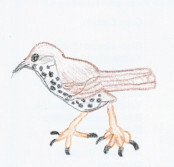 The student later recorded her observations of a Wood Thrush for the Panama Project. This past spring, Wyncote Audubon Society volunteers worked with elementary school students with the “On the Wing” edition of Audubon Adventures, to learn about spring migration. Our “Panama Project” grew out of this experience and we connected our students with students in Panama through Audubon Panama. Students at the Cheltenham Elementary School, Olney Christian School, and Overlook Elementary School participated in the project. After a series of lessons on migration, the students focused on several species of birds that arrive each spring to nest in our area but leave each fall to return to Central and South America to live during our winters. The students learned that specific species such as the Baltimore Oriole, Barn Swallow, Chimney Swift, Gray Catbird, and Wood Thrush are such birds. Last May and June, students observed several of these bird species. They recorded “Spring Migrant Field Notes” and drew a picture of the bird they observed. They used a special form created for the project. We collected their forms and provided their field notes to the Advanced Placement Spanish Classes at Abington Senior High School. These high school students volunteered to translate the field notes into Spanish. This summer the English and Spanish versions of the field notes have been sent to Audubon Panama. Audubon Panama will share these notes with the Panamanian students with whom they work. We hope that as “our” birds return south, some of the same species we observed will be species that the Panamanian students will see this fall. We are encouraging them to record their observations during our fall and early winter months and share them with our Audubon Adventure students. The Panamanian school year ends in December. Our hope is that through this project students will gain a greater understanding that our effort to protect birds is a hemispheric partnership. 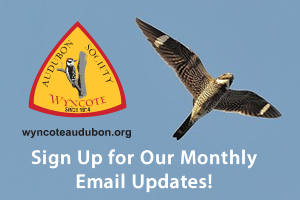 The Wyncote Audubon Society works with a range of Audubon related activities in area schools. Many schools conduct bird clubs, nature or ecology clubs, garden clubs, or other related programs. Most meet after school while others meet before school starts in the morning. Several have “lunch clubs” where students give up their lunch recess to participate in the program. Most are elementary age students but we have also worked with several middle schools and high schools. 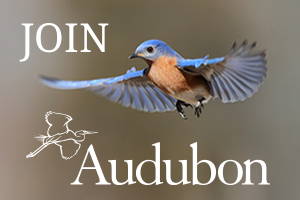 Wyncote Audubon provides the teachers and students with a subscription to Audubon Adventures, published in a “newspaper” format with a focus on a specific environmental topic. In addition, Wyncote Audubon volunteers provide a series of lessons and “bird walks” on the school property periodically throughout the year. Last fall we focused on raptors and hawk migration with opportunities to visit the Militia Hill Hawk Watch. Last winter we focused on winter birds, bird feeding and the Great Back Yard Bird Count.